Narrowly missing being struck by the speeding van, Richard made a fruitlessly obscene gesture at the swiftly-vanishing tail-lights, and pedaled grimly on, down the paved road to the Wyler ranch, marked by a pair of ornamental gates, adorned by sheet-metal silhouettes of longhorns, horses and cowboys in a frieze overhead. He rumbled over the cattle grid. Now on the faint morning breeze, he could hear the distant roar of the electrical generators – not far to go now. The last of the stars winked out, all but the very brightest, Venus lingering coyly just out of reach of the crescent moon’s embrace. Out beyond the huddle of lights, a helicopter rose from the ground, a dragonfly shape hovering in the pearl-colored sky. Fortunately, the first person he encountered who seemed to take any interest in him at all, when he approached the main pavilion were a pair whom he recognized, with considerable relief: Chris Mayall, lean and saturnine, and Sylvester Gonzales, looking uncommonly smug. “Yeah, we know,” Sylvester replied, without turning a hair. Richard looked upon the conspirators with dawning comprehension, not unmixed with horror as well as envy. “Well, get a bolt-cutter!” Richard demanded, thinking only of the strips that Araceli would subtly rip off his hide – she being abominably soft-hearted with regard to the suffering of others. Frankly, when it came to Phillip Noel-Barrett suffering, Richard was one inclined to sit back and enjoy, even add a couple of more judicious brands to the flaming spectacle. On the other hand, he had heard Araceli promise to take Noel-Barrett’s calls every five minutes or so – and how could any work be done in the Café under such conditions! “Sorry, Ricardo; they are about to begin filming the grand scene,” Chris replied, with a perfectly stunning lack of regret. “Likely you won’t find anyone here with a bolt-cutter or the time to go for one until it’s all done. Mega-A** Lydecker is real short of personnel this morning. I can’t think how that could possibly have happened…” At that point, both he and Sylvester exchanged a meaningful look and laughed synchronistically. Richard looked from one to the other, still torn between horror and envy. “All right, what else did the two of you do?” he asked, fairly certain that he would not welcome hearing the answer. “Me, I don’t want to miss a single minute. You want to tell Noel-Barret he’d better sit tight for a bit? We can watch it all from the back of the editing van and you can describe it to him through the door.” Chris shouldered the bag that held his First Aid gear and supplies, and Richard followed after; they knew the layout well, after having worked at the site, day and night for three weeks. The white-hot silver rim of the morning sun touched the crest of the gentle rise just east of location headquarters. It seared the eyes, to look at, as more and more of that blazing orb rose into that breathlessly blue sky. A pale thin mist hovered briefly over the grass, dissipating as the shadows lengthened. Richard flinched at the sound of the blast, as three explosions kicked up gouts of earth and smoke, about a quarter of the way down the hill. The sun floated higher and higher and suddenly silhouetted against it, the figure of a man on horseback. The horse pirouetted and reared, the man lifting a sabre in his right hand, sunlight flashing along it’s brazen length, and it seemed that the horse neighed a challenge …. We went to a Hancock Fabric outlet this last weekend – my daughter wanted to take advantage of the going-out-of-business bargains. She has developed an interest in needlework and embroidery of all sorts, and since we try to live rather frugally – well, sales prices do have their appeal at all times. But it is with sorrow that we visit the Hancock Fabric outlet within our neighborhood. We have both worked in a going-out-of-business-enterprise, so we can comprehend the absolute sorrow and shock of the employees. Upon my retirement from the military, I took on a temporary sales job in the Marshall Field’s outlet in San Antonio, which was closing – and part of that was that a fur-coat concession took up a small part of the retail outlet. Which experience gave me no end of insight into the whole ambiance of high-end department store retail sales… and yes, I sold fur coats, for a basic wage plus a small commission on sales. Which did mount up, as the months wore on, towards closing of the Marshall Field’s store. We lived on the paychecks from that job for simply months, as Blondie joined me on the fur salon sales force … but never mind. I can wholly and deeply sympathize with the employees of the Hancock Fabrics store, even past the point of merely apologizing as a customer for their situation. No, I do not want to say anything about how the sales floor will contract and contract again, the shelves will empty out, as the discounts grow deeper and deeper. The store will become a bare husk of what it was – and at the end, locked doors with a pile of pathetic and picked-over goods. So sad, so sad … since I do not have to put on the whole office-work skirt suit and all, every day, I have kind of gotten away from the sewing and tailoring that I used to do for myself then, and with my nieces both well beyond the age of wanting cute little dress-up outfits … but I will miss Hancock Fabrics anyway. The only time I really have to make an effort these days is for author events, where one simply has to make a splash, especially if there are other authors there. 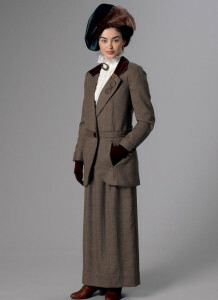 And depending on the genre or book, some authors do dress to impress and attract the eye. Another member of the on-line author circle I belonged to early on had a couple of books set in 19th century China. He had a full set of Mandarin robes with suitable accessories and that always made a bit of a splash at signings. On his advice, I have tried to do something with a sort of movie cowgirl look for book events. Lately I’ve been thinking that straight period 19th century might work better. But since we usually have to set up, and haul heavy boxes of books back and forth, the full crinoline, bonnet, bustle and trained gown is absolutely out. 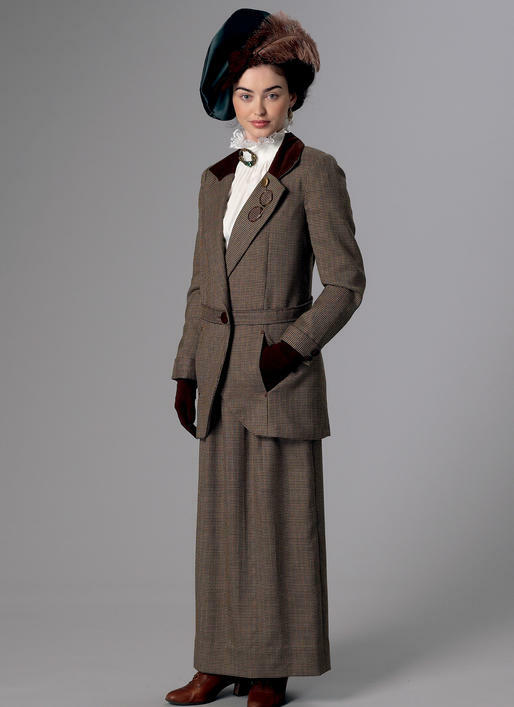 But there was a possibility in the Butterick Patterns costume section; an Edwardian walking suit; slim skirt, tailored jacket over a high-necked blouse. So, I bought the pattern, and there was some grey polyester suiting going for practically nothing – not that I am a fan of polyester, or that it will be in the least period-accurate. It will look nice and wrinkle-free without a lot of pressing and steaming. The Age of Aquarius Campground and Goat Farm celebrates their 48th anniversary this year at mid-summer – a well-established institution after a rocky beginning during the Summer of Love. And rocky would be the correct term to describe the original property; five forlorn and overgrown acres in a gentle bend of the San Antonio River, a bare quarter-mile from the pleasant little town of Luna City. The property was in the distant past, a part of a generous tract granted by Spain to Don Diego Manuel Hernando Ruiz y Gonzalez or Gonzales. Over the last quarter of the 19th century, much of the tract was sold off to various new owners, including the family of Morgan P. Sheffield, a moderately well-to-do gentleman from Philadelphia. Morgan Sheffield was diagnosed with tuberculosis around 1895 and advised to move to a more temperate climate for his health. While the climate of South Texas proved to be restorative to Mr. Sheffield’s health, the five acres of land was too rocky to farm in a traditional manner and too small to support more than a handful of cows. When the town of Luna City itself was planned, there was some thought given to establishing a hotel and spa on what was undoubtedly a pleasant situation on the banks of the San Antonio River on the outskirts of the proposed town. Attempts to dig a deep well on the site struck a thermal spring of naturally hot water, but that was the last of that run of good luck for a long time. The San Antonio & Aransas Pass Railroad bypassed Luna City, and Mr. Sheffield’s property. The hotel and spa were never built, the hot water well capped. During the 1930s, Mr. Sheffield’s heirs established a small motor court on the property, in the hopes of attracting vacationers; they built a row of small cottages, a combination bathhouse/lavatory built of concrete blocks, and paved areas for travel trailers, in the hopes of enticing travelers on Route 123 between San Antonio and the coast to come and stay for a night or two. However, travelers and campers remained stubbornly un-enticed; the cottages disintegrated through disuse and lack of maintenance, and the acreage became severely overgrown. In 1967 the property passed into the ownership of Morgan P. Sheffield’s great-grand-niece, Judith “Judy” Stillwell, a native of Austin, mostly because no one else in the remaining family really wanted it. Judith Stillwell was then a sophomore at the University of Texas at Austin, and the despair of her upright and generally conventional middle-class family. 1968 was the so-called Summer of Love, and all things counter-culture swamped practically every college campus in the land – including Judy Stillwell and a circle of friends, which included her live-in boyfriend, Sefton Grant. They embraced practically every ‘ism’ going, with near-religious fervor; vegetarianism, pacifism, nudism, paganism, and small-c communism. At the beginning of summer vacation, Judy, Sefton and a group of about forty other devotees – most of them fellow students at UT – conceived a grand plan to establish a New Age commune, where they would all live in harmony with nature. Where to plant their ideal Age of Aquarius? Why of course, the parcel which Judy had inherited, sight unseen, would be perfect. Her family agreed, over considerable misgivings – although they did extract as a condition of their approval and initial monetary support – that she and Sefton marry. Much to the astonishment of the Stillwells, Judy and Sefton acceded to that demand, and were married before a Justice of the Peace within days. They set out from Austin on the first day of the summer break; a long convoy of rattle-trap student vehicles, loaded down with everything thought necessary to set up their commune. Although students and addled with more than the usual quantity of late Sixties nonsense, there was a substantial streak of practicality, and among some at least, a willingness to engage in hard work. Sefton Grant, the son of a livestock farmer from Noodle, in Jones County typified that element. Sefton realized almost at once upon arriving at the site of the new commune – a substantial grove of oak and pecan trees, deeply tangled with wild mustang grape vines – that subsistence farming would purely be out of the question; it would be a project of years to rid the best soil of rocks and improve it with manure and compost. He suggested grazing goats, and raising chickens. This suggestion was discussed and ratified over the period of a week by the commune members, while they worked at setting up living quarters. To several trailers were added the first yurt, which eventually became the Grant family home, a series of tents, and a number of free-form shack/shed/hovels built from scrap lumber, cardboard, construction leftovers, and sheets of plywood. Early on, the members discovered a substantial source of raw materials for their projects at the Karnesville City Dump, some eight miles south of the commune site. The hot well was uncapped, and an old windmill repaired to pump hot water into the only remaining structure from the campground – the lavatory and bathhouse. But before the end of the year – even before the end of summer – the commune itself began dissolving. Fully a dozen members felt obliged to return to UT and complete their studies there in the fall, although they continued to consider the Age of Aquarius their more or less permanent home and to return there at intervals, especially at the time of the midsummer solstice. Two male commune members had draft numbers come up, and being no longer students, had to report for military service. Three more, being not yet of legal age, were tracked down and retrieved by their outraged families. The others, all but Judy and Sefton, drifted away before the decade was out, having concluded with some degree of chagrin, that living off the land and in harmony with nature involved too much backbreaking physical labor in the South Texas summer heat. It was also much more uncomfortable then it had sounded in long and substance-addled discussions in the Student Union. Only Sefton and Judy remained constant, eventually raising two sons and a daughter and achieving some degree of eccentric comfort in their chosen lifestyle. They acquired beehives, goats, chickens – Judy being much more inclined than Sefton to consider them as pets – and the manure from the latter slowly improved the patch where they established a thriving truck garden. Judy, who dabbled in various arcane household skills, including weaving, herbal medicines, fortune-telling, and macramé-knotting, worked out recipes for hand-made soaps, and goat-milk cheeses, and established a tiny but thriving business selling them at local markets, along with honey and fresh vegetables in season. In time, they were able to pay to have an electric line run out to the campground, on the grounds that people paying to camp there expected it, although their own home establishment depended on solar panels, a wind-mill and kerosene lanterns. And every mid-summer, the long-dispersed commune members return; middle-aged and prosperous, to fill up the campground and reminisce about that long-ago summer with Judy and Sefton, recalling youthful dreams and illusions, to light a bonfire in the grove and dance sky-clad to the Stones, the Doors and Janis. The Grants’ three children – all now well-grown, also prosperous and utterly conventional – do not come to visit during that week. There are things which once seen, cannot be unseen.